Google crawls your entire website to find links, so as to eventually index them. To prevent the waiting time involved (the whole process can take days or even weeks), Google added the “Submit a sitemap” feature in Webmaster Tool. Once you activate the sitemap.xml setting from Squirrly, you will find the sitemap at http://yourdomain/sitemap.xml. For activation, go to your WordPress dashboard > Squirrly > SEO Settings > Let Squirrly SEO optimize this blog. You’ll have to switch the XML sitemap setting to Yes. 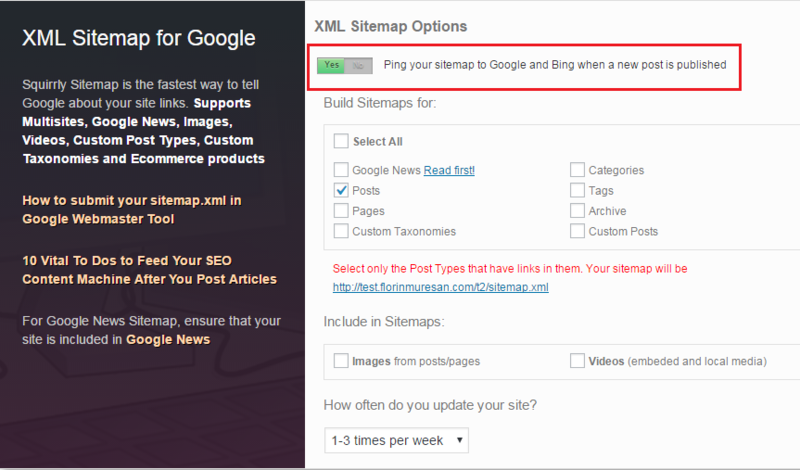 You can also find your sitemap at Settings > Permalinks – in case you are using custom permalinks for your blog. If not, then your feed link will be like this: http://yourdomain/?feed=sitemap. If you’ve already created an account in Webmaster, go to Google SiteMap List and add sitemap.xml in the sitemap area. If not, click here to learn how to set it up. Then, click “Submit Sitemap” button and that’s it. After you submit the XML file to Google, the verification process usually takes 20 to 30 minutes. You will now see the indexing stats. If you want to index a specific page in Google, go to Google Bot and add your page there. Click the index button and Google will crawl your page in the next 5-10 minutes. You don’t have to do this for all your posts. Squirrly will automatically exclude the password protected posts. In the same SEO Settings panel, scroll down to the XML Sitemap for Google section, where you will see a Ping option. Switch it on and Squirrly will inform Google and Bing about your new posts. 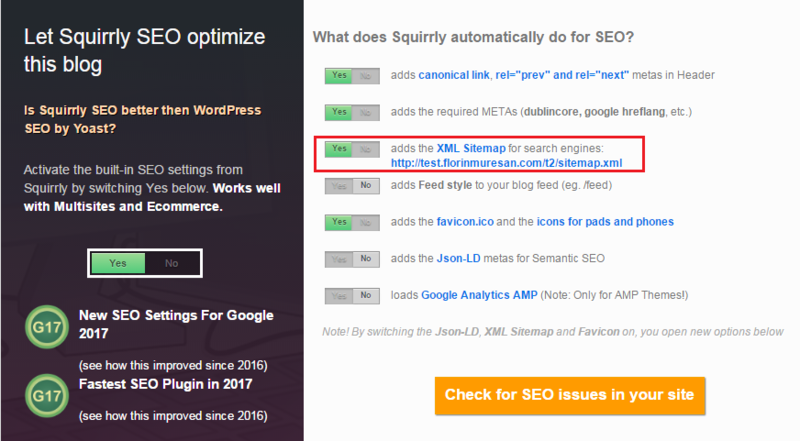 So, as you publish new content, Squirrly will automatically add it to your XML sitemap and send it to search engines. NOTE! Squirrly will ping your new post only once, rather than each time you update its content, to prevent it from causing ranking problems. 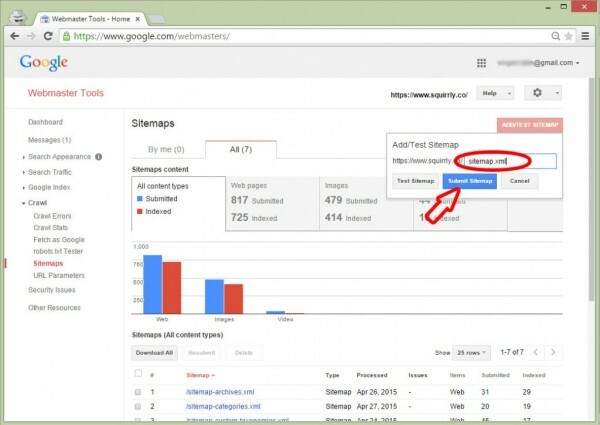 To check the traffic to your website, don’t forget to add your site to the Google Analytics account. I’m very happy with this plugin, help a lot people like me that aren’t expert still in SEO. The support is very efficient and fast, usually they answer in 1 hour ! Some little conflict with some other plugin but the support help to resolve all the that little issue. I’ve been using Squirrly since late 2015, and I just noticed that my sitemap.xml has not been updated since late 2015??? Shouldn’t the sitemap.xml be updating everytime I add a new post? I add new posts weekly and I have all proper boxes checked for sitemap in squirrly for posts, pics, etc….? Is it possible to no index blog categories thru the free version?